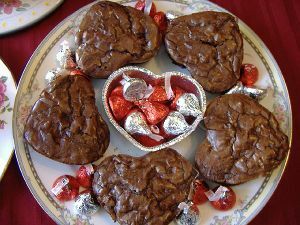 Ok, so I'm a little early to be treating myself this way, but I'm SO in the Valentine mood. I just couldn't wait. And I've been working so hard, I needed a little break and a bit of chocolate. No fancy recipe here today (that'll come tomorrow! 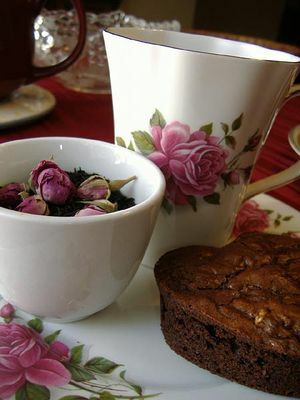 ), just some photos I wanted to share of my special rose-tea-chocolate afternoon treat. Lovely little roses and chocolates makes the tea party interesting for valentine. It is a nice idea too. Very interesting gourmet shots. Thanx for idea.R. This looks so pretty! My seven year old daughter has been wanting to have a special tea party for a couple of her friends, and I think we might just adapt some of your ideas here. Thanks! Such beautiful photos. Thank you! 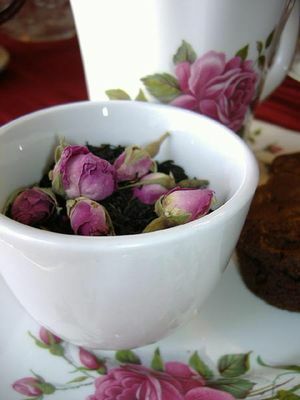 I just got a tin of loose-leaf rose tea from republic of tea. It is also quite nice! 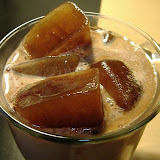 This blog is just awesome..I love tea and you've been doing a great job with it. 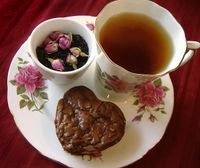 The Valentine's Day special is really romantic.Do peep into my blog and lemme know how you like it!! Thanks Nik! :)) Sometimes I just need to make myself a pretty treat and use the pretty china. It pleases my inner tea party lady.